For the official news website of the university, please click here. BROWNSVILLE & EDINBURG, TEXAS – NOV. 11, 2015 – The University of Texas Rio Grande Valley honored veterans with two simultaneous ceremonies on its Brownsville and Edinburg campuses on Wednesday. Students, faculty, staff and veterans gathered at the Chapel Lawn on the Edinburg Campus and on the Main Lawn of the Brownsville campus. The events were sponsored by the ROTC, Student Involvement, Student Veterans of America (SVA), Veterans Services and Veterans Upward Bound (VUB), a federally funded program to prepare and assist eligible veterans to access and pursue higher education. “It’s a great honor to honor our veterans, and we have a number of our veterans here from World War II, the Korean War, and from all of our conflicts since that time. Thank you so much for being here,” UTRGV President Guy Bailey said at the Brownsville ceremony. He pointed out that the ceremony began at 11 a.m. on Nov. 11, to commemorate the date and time of the ending of World War I in 1918. UTRGV Vice President for Student Success Dr. Kristin Croyle, who spoke at the Edinburg ceremony, expressed her appreciation for veterans and praised UTRGV’s student veterans for the contributions they make to the campus community. Eloisa Tamez, a U.S. Army veteran, UTRGV professor of nursing and keynote speaker at the Brownsville event, said the nation’s veterans symbolize the freedom we enjoy. Tamez, whose father was a veteran, served as a nurse for 27 years when she joined the nursing service workforce. Those at the Edinburg event heard from guest speakers, Capt. David Weiss of the U.S. Army National Guard, and former U.S. Army Sgt. Lynette Linn, who talked about their experiences in the military and about the importance of taking time out to honor those who made the ultimate sacrifice while serving their country. “When you live your lives, make sure it’s a testament to those who are no longer able to live theirs,” Weiss said. Both campus ceremonies had the presentation of colors and a 21-gun salute. 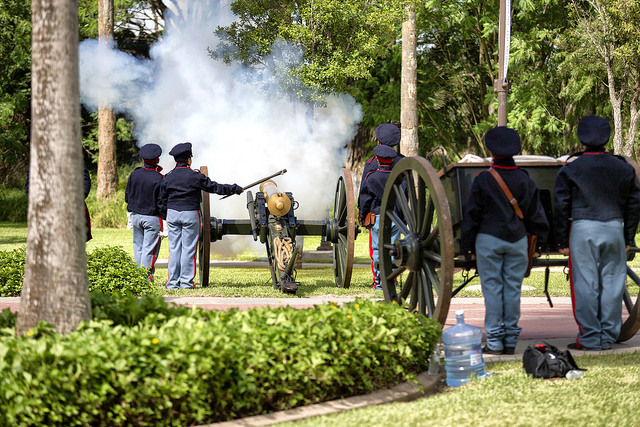 At the Brownsville ceremony, three cannon salutes honored those currently serving in the military, those who served in the past and those who died while serving. Students said they appreciated that UTRGV was honoring veterans and that the university is providing services for student veterans and their loved ones. Patrick Roberts, UTRGV’s chapter president of the SVA, served eight and a half years in the U.S. Marine Corps. He said it is important for student veterans to have resources available to them, to help them adjust from military to college life. Quentin Cammack, a U.S. Navy veteran who earned a bachelor’s degree in Criminal Justice from UTRGV legacy institution UT Brownsville, said Veteran’s Upward Bound helped him with a variety of needs when he was a student, like helping him enroll in classes and submitting paperwork for the Post 9/11 G.I. Bill. The University of Texas Rio Grande Valley. Awesome Inc. theme. Powered by Blogger.